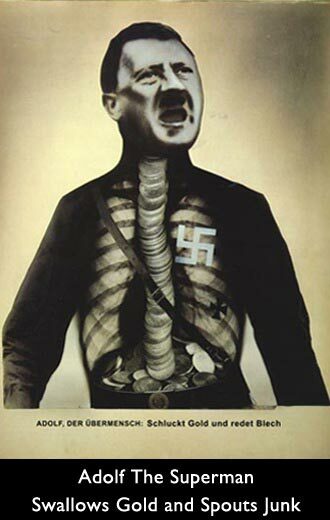 “Adolf The Superman” is John Heartfield’s famous portrait of Adolf Hitler with his chest and belly full of gold from his financial backers. It is certainly one of the most famous political posters. Heartfield combined an actual photo of Hitler with an x-ray to create this unforgettable image of a politician spouting ugliness to help move his country toward a profitable war. 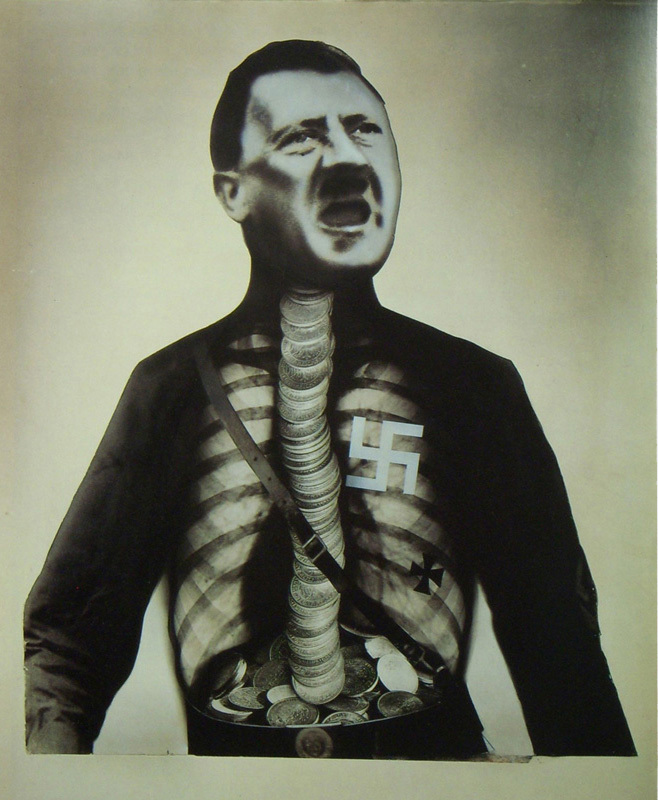 Heartfield brilliant visual makes it clear the Führer is performing a miracle of political alchemy. Hitler converts gold, financial contributions from war investors, into garbage to stir up the German people. This brilliant montage was originally an AIZ cover. A German count, a member of the German nobility, recognized the need for this montage to be distributed as a poster. The poster appeared on walls all over Berlin. Nazis became infuriated wherever this poster appeared. Heartfield was not hiding. He was a resident of Berlin. The Nazis knew where he lived. He was beaten and thrown from the second story of a streetcar. Incredibly, he managed to avoid assassination until Easter Sunday, April 14, 1933. An SS assassination squad kicked in the door of his apartment. The thin five-foot-two artist jumped through his French windows.